Paleo waffles. Hmm... Something doesn't sound right. Did cavemen eat waffles? Did they even have waffle irons? For that matter, what the heck is a "waffle" anyway? "Take flour, cream, sack (a dry sherry), nutmeg, sugar, eggs, yeast, of what quantity you will; mix these to a batter and let them stand to rise; then add a little melted butter and bake one to try; if they burn, add more butter: Melt butter with sack, refin'd sugar and orange-flower water for the sauce." The etymology of the word "waffle" owes its roots directly to the Dutch word "wafel" which in turn originates from the the Middle Dutch word "wafele" which came into use at least as far back as the 13th century. "Wafele" and the French word "walfre" (which first came into use ~1182AD) are both descendants of the Frankish root wafla. Which can mean either honeycomb or cake. So there you have it, the wafla, or waffle, is a honeycomb-esque cake and it seems like the standard recipe has been pretty much the same for at least 300 years. Which brings us back to Paleo Waffles. The Paleo diet is all about whole, unrefined, unprocessed foods and on the surface, a waffle seems to be the antithesis of Paleo. And cavemen, certainly, didn't eat them. But is Paleo necessarily about what "cavemen" ate? According to many of the critics of Paleo, and even Mr. Primal himself (Mark's Daily Apple - "We Don't Know What Constitutes a True Paleo Diet") we don't and can't know what cavemen actually ate, so, defining a modern "Paleo" diet by this metric alone is a blind path. What we do know, however, is that cavemen and extant hunter gatherers ate food, not food like substances. So a modern Paleo diet should be one built upon a foundation of real food. We also know that gluten-containing grains did not feature largely in the diets of our ancestors until the agricultural revolution ~10,000 years ago. (Although some human populations likely made use of wild cereals like sorghum as far back as 100,000 years ago.) So a modern Paleo diet should be gluten-containing grain free. Presumably, we are following a modern Paleo diet because we are seeking a particular result, be that weight loss, increased well being and vitality, or amelioration of disease. So a modern Paleo diet should help us reach our own personal health and fitness goals. 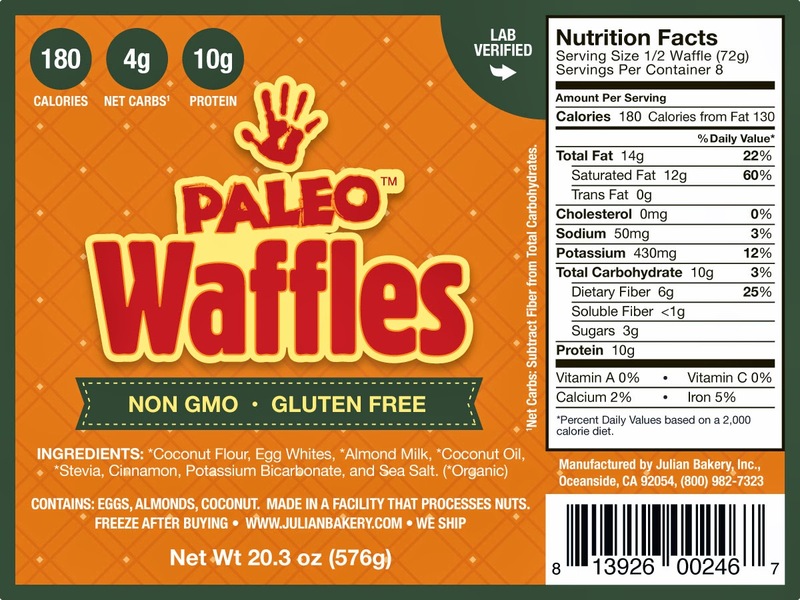 By the standards of real food, gluten free, and supporting of health and fitness goals we might just be able to make a case for Paleo Waffles by Julian Bakery as being a valid part of a modern Paleo diet. You see an ingredients label that lists: coconut flour, egg whites, almond milk, coconut oil, stevia, cinnamon, potassium bicarbonate, and sea salt. So "real food" gets a check. Upon further scrutiny, you'll find that none of the ingredients contain gluten, and even better, many are organic and all are gmo free. So "gluten free" gets a check. And finally, do Paleo Waffles support your fitness goals? Well, they are low in sugar and carbohydrates, so if you're trying to lose weight they'll probably help there. They are also high in protein, so if you're exercising regularly and want to build or maintain muscle mass they'll support that goal as well. In terms of disease risk, some might shy away from egg whites if they suffer from an autoimmune condition (see "The Autoimmune Protocol" on The Paleo Mom for more on this) and for those with allergies or sensitivities to tree nuts coconut should be avoided (see "Tree Nut Allergies" on the Food Allergy Research & Education site). So "health and fitness goals" gets an "it depends." Bottom line, it's up to you to use the information that's available (and there is lots of information available) to determine for yourself whether or not something like Paleo Waffles fit your modern Paleo Diet. My personal take is that they make a great occasional treat and are actually really really good. If I were to make gluten-free waffles at home, I would probably you almost the exact same ingredients they do, so having some frozen Paleo Waffles in the freezer makes for less messy kitchen on the weekend. So that's my take, and I encourage you to share yours in the comments section below. Plate the waffle and top with almond butter, sliced banana, a drizzle of honey, and a sprinkle of cinnamon. Plate the waffle and top with cashew butter, blueberry preserves, and whole berries.